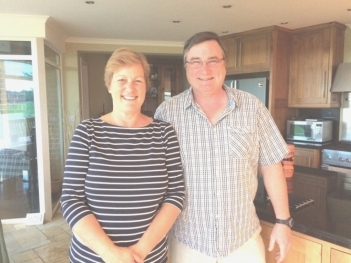 Richard and Clare Oirschot moved into Park Cottage, Charlton Lane, in May. They have moved from West Wickham, where they have lived for 25 years. In West Farleigh they are nearer to their woklplaces. Clare works at the Big Cat Sanctuary at Headcorn. Richard is a Chartered Accountant and is doing consultancy work for Medway Housing Association, Croydon NHS and some private companies. Richard is also a Parish Councillor in Camber were they have another property. They like to visit South Africa on alternate years to visit the game reserves. They are both interested in the conservation of animals. West Farleigh is ideal for them as it is equidistant from their three grown up children. Their dog has more green space and freedom that he did before. There is talk of another to keep him company! They are keen to become part of the community and will join in when they can. Clare is musical and enjoys Amateur dramatics. Richard like to play cricket, so the Sports Club will no doubt snap him up!